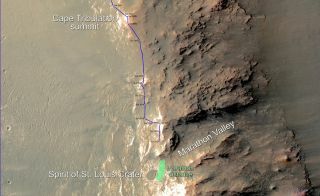 In February 2015, NASA's Mars Exploration Rover Opportunity approached a cumulative driving distance on Mars equal to the length of a marathon race. Image released Feb. 10, 2015. NASA's long-lived Opportunity Mars rover is about to run a marathon on the Red Planet. Opportunity has now covered 26.094 miles (41.994 kilometers) since touching down on Mars in January 2004, leaving the rover just 660 feet (200 meters) shy of the marathon milestone, NASA officials said today (Feb. 10). An Olympic marathon is 26.219 miles (42.195 km) long. "When Opportunity was in its prime mission 11 years ago, no one imagined this vehicle surviving a Martian winter, let alone completing a marathon on Mars," Opportunity project manager John Callas, of NASA's Jet Propulsion Laboratory in Pasadena, California, said in a statement. "Now, that achievement is within reach as Opportunity approaches a strategic science destination," Callas added. "What's most important about the longevity and driving distance the mission keeps extending are not numerical thresholds, but the wealth of scientific information returned about Mars, made possible by these feats." Opportunity holds the record for the longest distance driven on the surface of another world. Second place belongs to the former Soviet Union's Lunokhod 2 moon rover, which traveled 24.2 miles (39 km) in 1973. Opportunity and its twin, Spirit, landed three weeks apart in 2004, and were tasked with searching for evidence of past water activity on Mars. The two golf-cart-size robots found plenty of such evidence, and then kept on exploring the Red Planet, far outlasting their original three-month-long prime missions. Spirit stopped communicating with Earth in 2010 and was declared dead a year later. Opportunity remains active and has been exploring Endeavour's rim since August 2011. But Opportunity is showing some signs of its advanced age. The rover's robotic arm has been arthritic for quite some time now, and recently, Opportunity began experiencing problems with its flash memory, which can store data when the power is off. Therefore, the Opportunity team has been beaming the six-wheeled robot's data back to Earth every day (via NASA's Mars Odyssey and Mars Reconnaissance Orbiter spacecraft) before the rover powers down for the night. They plan to upload new software in the next few weeks, in an attempt to fix the flash-memory issue. However, funding issues, rather than health problems, may ultimately bring the rover to a halt: The White House's proposed budget for fiscal year 2016, which was released last week, allocates no money to Opportunity's mission. It costs about $14 million per year to operate Opportunity.